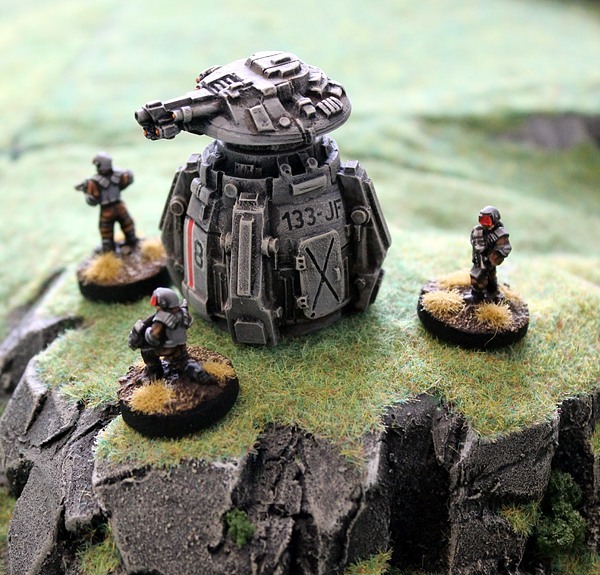 It is the high summer Bank Holiday Weekend here in the UK and in celebration of a short holiday in the sun the three pillars of wargaming excellent called Alternative Armies, 15mm.co.uk and The Ion Age are having a free postage on all orders event! Four days of free postage fun! From now until 9am GMT Tuesday 30th August 2016 we are having a free worldwide postage on all orders over 10.00GBP in product value! This applies to our three websites and all our 6mm, 15mm and 28mm miniatures and game systems in fact everything on our websites you can put in your cart (not downloads). All you need to do is add to the cart and the website will do the rest. Click on the links to go to each site. As many orders as you like to anywhere in the world. Remember that any special offers that are currently running are included in this promotion. 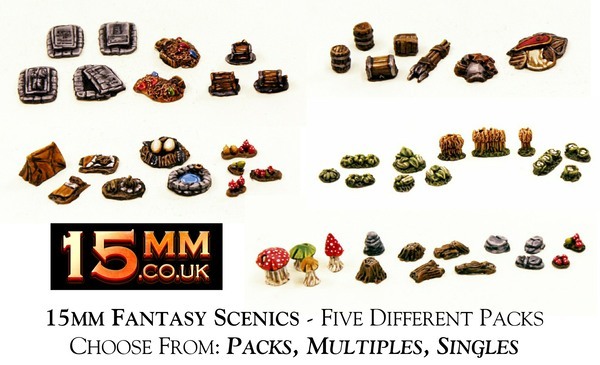 So if you like Flintloque, High Fantasy, Ganesha Games and other 28mm scale ranges such as Grinning Skull and Asgard check out Alternative Armies. 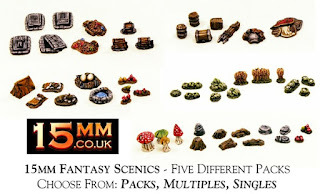 If you like 15mm scale including HOT Fantasy, HOB 15mm Fantasy Buildings, Sengoku Japanese Fantasy, TTF Fantasy, HOF Science Fiction, Laserburn, Altuos Renaissance, Pony Wars and ACW, Isarus Dark Age, Medus Medieval along with 6mm sci-fi and a lot more go to 15mm.co.uk. Space Opera science fiction wargamers should look to the unique range and setting of The Ion Age for excellent 15mm and 28mm miniatures, vehicles and rule systems. Excellent! Our three websites are having a free postage event. If you place an order for more then ten pounds (10.00GBP) the shopping cart will automatically give you free shipping worldwide. While the vast majority of wargamers are happy to place orders in this way we know that some of you would like to place a combined order by email and receive a paypal invoice to pay. This is totally fine with us and here is what to do for a combined order by email. Firstly choose your point of contact. Is it Alternative Armies, 15mm.co.uk or The Ion Age? Choose one and email us on sales@alternative-armies.com, sales@15mm.co.uk or info@theionage.com. Make your email title 'combined order' and give us your name, your shipping address, your paypal email address and a list of codes and quantities that you want to order from across our ranges. We will then reply with a total and a paypal invoice. You will get a free monthly miniature if you have Ion Age codes and you will get any other items offered free if applicable from the other websites if you have codes from its ranges in your order. We typically reply quickly but be assured you WILL NOT miss the free postage on your combined order as we will honour it as long as your email comes in to us before the offer ends. Thanks and enjoy the event! 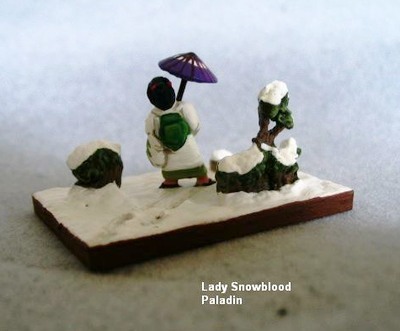 Alternate: 1 x Paladin @ 4 AP – Lady Snowblood, 1 x Dragoon @ 4 AP “Ryu”, 1 x Sneaker – Ninja in disguise as a monk and a peasant, 2 x Lurker @ 1 AP Ninja with blowgun and throwing bomb. Stronghold - Ninja horses secreted away with horse holder Ninja while the other Ninja are on a raid. I usually make extra elements so I can switch the army up at times to make it both more flexible and it let’s me feel it is a slightly different army. 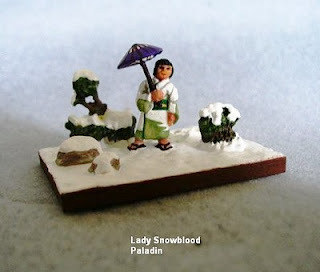 Here are the steps I did in making Lady Snowblood from the SGF19 figure. 1. Remove the fan from her right hand and drill a hole to take the handle of the parasol. 2. Reshape her hair so it is just close cropped to her head, and add a bun in the back. 3. Add a red comb and a red “Thunder Sand Bomb” to her hair where the bun is. 4. Use the remaining long portion of her hair to reshape into the bow of her obi (sash). 7. Drill a hole in her lower left sleeve to take the katana, and add just the blade portion. 8. Remove the flare from the outer sides of her trousers. 10. Take a straw “coolie” hat from a 28 MM figure to create the parasol. 11. Drill a hole in the bottom of the parasol and add the handle. Then it can be added to her right hand before or after painting as per your painting style. I used brass wire for the handle. 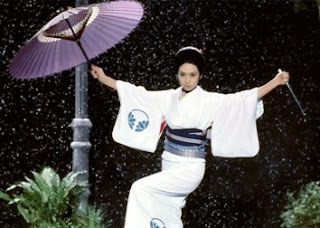 A note regarding the parasol handle – I depicted her with her katana drawn so the parasol handle is a dark color overall. However, if you elect to not have her with her katana drawn, then the bottom end of the parasol handle would be white as that is the handle of her katana which she carried it in the handle of her parasol. All that’s left is to paint her in the kimono of your choice and base her. And she wore quite a variety, including striped ones to ones with butterflies, to one with circles and my favorite the pale green on white flame pattern. I selected the a snow base as depicted in the final scene of the first movie. It shows her out in a garden covered with snow and I tired to achieve that while at the same time not creating an element that looked like it was a moving house. Also, a snow covered base seemed only right due to her name. Having completed the HOB1 Human Starter Settlement set of 15mm buildings I was very keen to use it for a scenario and having also completed Goblin and Human armies I decided to have a Human force coming to the rescue of an outlying village as Goblin raiders move to attack. I decided to use all five buildings in the set together as one settlement and marked out an area 9" square in the exact middle of a 6' by 4' table. 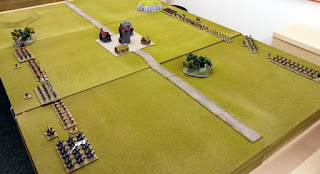 It's important to be clear on the boundaries of the village as I wanted it to count as rough terrain for movement purposes, count as a defensive position for a unit that charges or is charged while completely in the village (to represent house to house fighting), and it may also be critical to decide who wins the scenario. I used mdf tiles with paper printed to represent cobbles glued to it, but you could simply use a piece of paper or cloth cut to the appropriate size. Other scenery wasn't important to the scenario goals so I decided to place a road from one short table edge to the other and passing through the middle of the village. I then used 2 hills and 2 areas of light woods with 1 hill and 1 area of light woods positioned by each player.This will be used purely to break up the table so you can use as much or as little terrain as you have available and you are happy with. Each force will then deploy anywhere on opposite long table edges up to 6" on to the table. The game was set for 6 turns with the Goblin raiders going first. You could set a higher number of turns but using only 6 means that neither army can delay and both players need to be decisive. The forces I used were set at a 400 points limit maximum which worked perfectly with the units I have, but the only limit to this is your figure collection and the size of playing surface available. As both forces would have to manoeuvre, no artillery pieces were taken by either army. The human force was a little bit light on points, mainly because the goblin force took 4 monsters whereas the humans only had 2 but as the monsters on the human force were both magical I felt that this evened out the points difference. 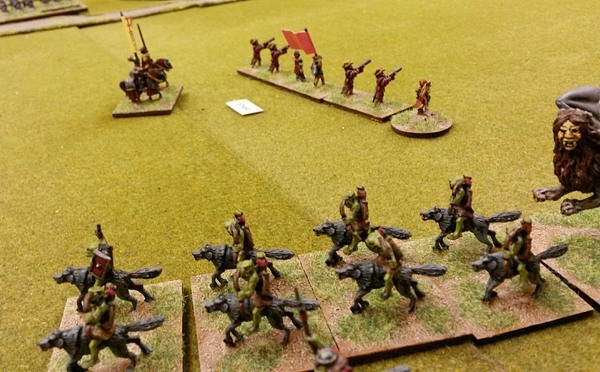 General (45pts), Magic User (50pts), Hero (35pts), Hero (35pts), Goblin Knights (9 stands of heavy foot = 27pts), Goblin Spearmen (10 stands of medium foot = 20pts), Goblin Archers (8 stands of archers = 12pts), Wolf Riders (10 stands of light cavalry = 20pts), Wolf Riders with bow (6 stands of mounted archers = 15pts), Trolls x3 (Monster = 35pts x 3 = 105pts), Manticore (35pts). 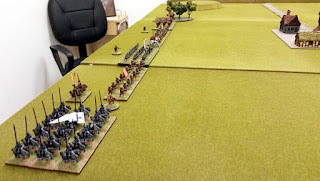 General (45pts), Magic User (50pts), Hero (35pts), Hero (35pts), 2 Handed Swordsmen (9 stands of heavy foot = 27pts), Templar Infantry (9 stands of heavy foot = 27pts), Halberdiers (10 stands of medium foot = 20pts), Handgunners (8 stands of archers = 12pts), Mounted Templar Knights (9 stands of heavy cavalry = 31.5pts), Pegasus (35pts), Griffon (35pts). This scenario would easily work with other armies. There is no reason why Elves or Dwarves wouldn't want to save a human village as they are their allies or you could also have an Orc or Goblin force trying to save their own village. There is an excellent set of Goblinoid buildings in the HOB2 Orc Starter Settlement that could be used instead. The objective is to have control of the village. - One force has completely destroyed the opponents units. - One force has a unit completely within the village with no opposing units touching any part of the village. This will count as a major victory regardless of losses. - Both armies have units within or touching the village boundary. The winner is the army with the highest points value of stands completely within the village. This will count as a minor victory regardless of losses. - One army has a unit touching the village and their opponent doesn't. This will count as a minor victory regardless of losses. Any other situation will count as a draw. It was agreed that until the first unit made contact with the enemy no activation rolls would be needed. Goblins - The Manticore was attached to the wolf riders, while 2 Trolls attached to the medium infantry and 1 Troll attached to the heavy infantry. The wolf riders and wolf riders with bows both moved to the left flank at top speed, with the latter in a march column in order to provide passing volleys. 2 heroes went with them. The archers and the magic user moved to the left of the village. The general then took the medium infantry straight towards the village with the heavy infantry moving to the right. Humans - The Pegasus joined the medium infantry to add to their speed while the Griffon joined the heavy infantry on the left flank. The Knights moved to the right to guard that flank with the general following up behind. The handgunners and magic user moved up to support them on their left. The medium infantry moved towards the village with a unit of heavy infantry on either side, the 2 handed swordsmen to the left and the templar infantry to the right. 1 hero went with the medium infantry while the other moved to their right with the templar infantry. Goblins - The medium infantry continued the rush towards the village but didn't quite reach it, while the heavy infantry continued their slower advance to the right. The archers and magic user also moved forwards to try to get in range. The wolf riders with bows rode around the edge of the woods with the aim of passing the handgunners on their flank next turn. Finally the wolf riders charged the knights. Although they are light cavalry charging heavy cavalry the attached Manticore gave them a magical attack and the fantasy races unique rules for goblins means that wolf riders get +1 to their dice roll in hand to hand combat. In the end both units lost 2 stands. As the first units had made contact, it was now necessary to make activation rolls so it was important that units had leaders within their 12" command radius. Humans - The magic user cast a Shield spell on the handgunners that she was attached to meaning that enemy ranged attacks had a -1 modifier on their dice roll. 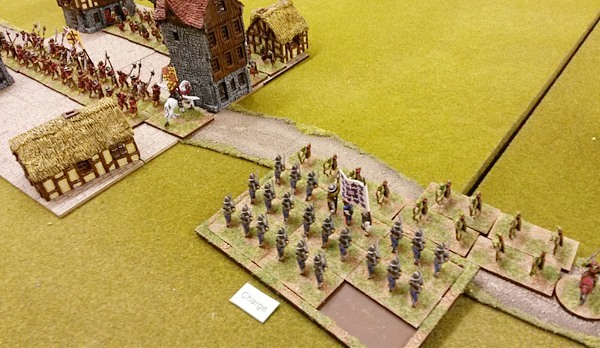 Unfortunately the fear of the enemy bearing down on them caused the handgunners to then fail their activation roll but although they were disorganised, they remained in place. With the help of the Pegasus the medium infantry reached and entered the village, while the heavy infantry continued to move up to either side of them. Finally the heavy cavalry charged back at the wolf riders but due to a low roll the knights lost a stand while the wolf riders only lost 2 stands. Goblins - On the right flank the heavy infantry failed their activation roll despite the general being in range but remained in place disorganised, while the medium infantry moved into the village.The archers and magic user also moved up to get into firing range. 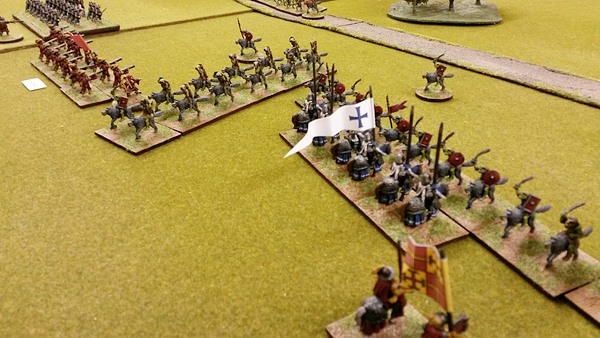 The wolf riders with bows passed between the knights and handgunners who received their passing volley. Due to the shield spell the handgunners only lost a stand though. The wolf riders attacked the knights again. Due to the Manticore's magic attack and a good dice roll the wolf riders only lost a stand but the knights lost 3 stands. Humans - The magic user recast the Shield spell on the handgunners, while the unit wheeled round to face the wolf riders with bows on their flank but failed to down any with their shooting. The 2 handed swordsmen on the left flank continued to advance and the medium infantry reached the middle of the village despite the reduced movement it caused. The templar heavy infantry charged the goblin archers and just managed to reach them. The defensive fire didn't cause any damage but in hand to hand combat the heavy infantry lost a stand while the archers were lucky to only lose 2 stands. The cavalry combat continued on the right flank. Despite their heavy losses a herculean effort from the knights meant that they only lost a stand whereas the wolf riders lost 3 stands. Although the goblins still had the Manticore, only 2 stands of knights and 2 stands of wolf riders remained. 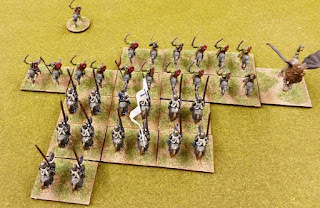 Goblins - The wolf riders with bows continued to move around the handgunners. Although they finished their move in range the handgunner's defensive fire failed to cause any hits while the goblin's shooting downed 2 more stands of the humans. The medium infantry charged the human medium infantry in the centre of the village. The humans were halberdiers so were treated as having polearms which reduced the effect of the goblin attack and as both units were within the village it was agreed that the modifiers for a defensive position would cancel out. The result was that the goblins lost 2 stands and the humans lost 4 stands. The magic user was attached to the goblin archers and cast True Flight to boost their shooting but they failed their activation roll and retreated disorganised so could not fire. 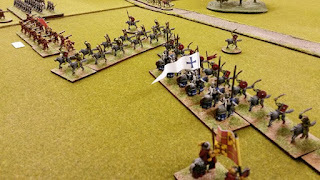 The heavy infantry moved forward again to try to counter the 2 handed swordsmen but their failure to move last turn meant that they were still a fair distance away. The combat continued between the wolf riders and the knights. The goblins wiped out the remaining knights but lost 2 stands themselves so were also destroyed. Only the Manticore was left standing facing the human general who luckily hadn't attached himself to the combat. Humans - The general moved back behind the rapidly reducing handgunners for defence and the magic user cast Shield on them again. 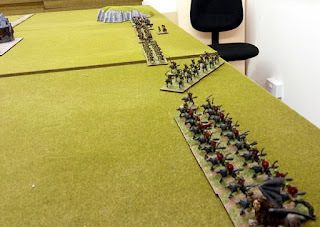 The Shield meant that the goblins defensive fire didn't cause any damage before the handgunners fired back at the wolf riders with bows downing 2 stands. The Templar heavy infantry moved towards the goblin archers whose defensive fire didn't do any damage. 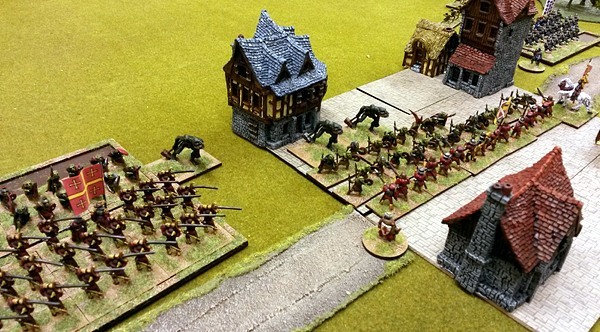 A disaster occurred in the village where the human medium infantry attacked the goblin medium infantry losing a stand themselves but doing no damage to the goblins at all! Finally the 2 handed swordsmen charged the goblin heavy infantry. They made up for their comrades in the village by losing 1 stand themselves but removing 4 stands of goblins. Goblins - The Manticore moved to join the wolf riders with bows along with a mounted goblin hero. The magic user cast Fright on the goblin archers meaning that if the human heavy infantry charged them they wouldn't get a charge bonus. The goblin heavy infantry planned to charge back at the 2 handed swordsmen but failed their activation roll retreating back towards their general disorganised. The medium infantry again attacked the human medium infantry in the village with the goblins losing 2 stands but the humans losing 3 stands. The wolf riders with bows continued to move around the flank of the hangunners and their passing volley took down another 2 stands of humans. The goblin archers fired at the templar heavy infantry bearing down on them and removed a stand of them. 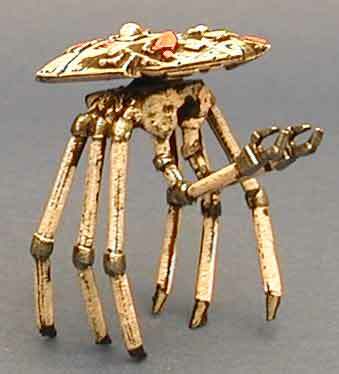 Humans - The general remained behind the handgunners and the magic user continued with her Shield spell. The 2 handed swordsmen charged the flank of the goblin medium infantry in the village losing a stand but removing 2 stands of goblins. 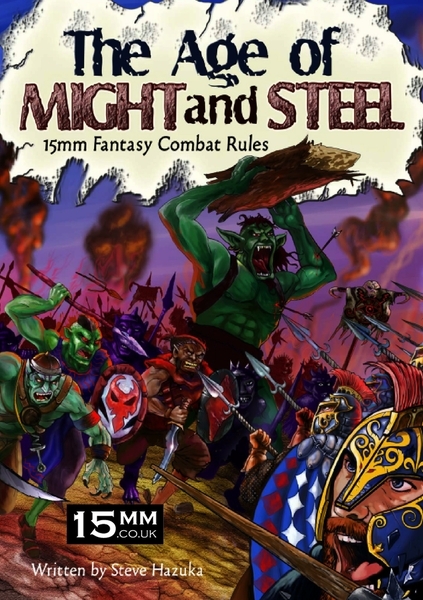 The medium infantry then also fought the goblin medium infantry but lost 2 stands for the cost of only 1 stand of goblins. This wiped the humans out leaving just the Pegasus. 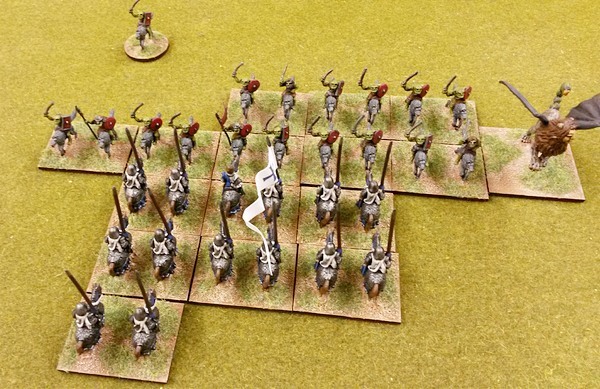 The templar heavy infantry charged the goblin archers. No stands were lost from the defensive fire and in combat despite the Fright spell the humans only lost a stand but destroyed 4 stands of goblins. The handgunners wheeled round to track the wolf riders with bows but their shooting didn't do any damage. As the scenario was set for 6 turns this was the last turn but due to the high losses on both sides it looked as though it would be decisive. Goblins - The general moved towards the village and the magic user cast Inspire on the archers to bost their activation score as they were now below 50% strength. The archers failed their activation roll despite the magic users efforts with the roll of a 1 and then routed with a second roll of 1! The heavy infantry moved towards the village to contest ownership but couldn't quite reach it. The medium infantry continued to fight the 2 handed swordsmen but only removed a stand of humans compared to losing 2 themselves. As this left only the goblin command stand then the unit was treated as destroyed despite the Troll that was still attached. Had there been a further turn the Troll could then attach to another goblin unit. The wolf riders with bows left the 3 remaining stands of handgunners alone and also moved towards the village. Being light cavalry they had enough movement to reach it but couldn't charge the human infantry as they are mounted archers. They attempted a volley against the 2 handed swordsmen but didn't do any damage. Humans - The general moved towards the village and the magic user cast Inspire on the handgunners to boost their activation roll as they were also below 50% strength. The 2 handed swordsmen wheeled into the village facing the goblin table edge. The templar heavy infantry then wheeled around the edge of the village putting them on the goblin side of it. Finally the remaining handgunners moved as fast as they could towards the sanctuary of the village. This was a minor victory to the human force. Both armies had units within or touching the village but the human heavy infantry had more than half of the unit's stands within the village whereas the wolf riders with bows were only touching the edge. Although it was a minor victory for the humans this battle could have gone to either force. The goblins were unlucky with the number of failed activation rolls especially with the heavy infantry failing to move at an important time. Then when the same unit lost 4 stands against the 2 handed swordsmen this was probably what won the game for the humans. 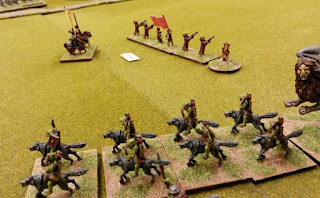 The goblin wolf riders performed well against the human heavy cavalry and the wolf riders with bows showed how they could be a very useful unit for breaking up an enemy line and disrupting their plans. It would have been interesting to carry the game on to see who was left standing. The human heavy infantry units were both down to 6 stands each although the 2 handed swordsmen had a Griffon attached and the templar infantry had the Pegasus. The handgunners were no longer effective being only 3 stands. The goblin heavy infantry despite only having 5 stands left now had 3 trolls attached so was the strongest unit left on the table (as long as they could get some decent dice rolls!). The wolf riders with bows were behind the human lines and although they had 4 stands left the also had the Manticore and a hero attached. The General and his standard bearer sat on their tired horses at the edge of the village. The Goblin heavy infantry and lumbering Trolls had just disappeared from view and he knew from experience that the few remaining Wolf Riders would soon follow. The Goblins hadn't had much time to do damage to the houses or hurt the villagers who were bringing food and water to his battered troops. It had been a costly victory with around two thirds of his men being lost and it was impossible to pursue the remaining Goblins. All he could do was fortify the village as much as he could and await reinforcements. 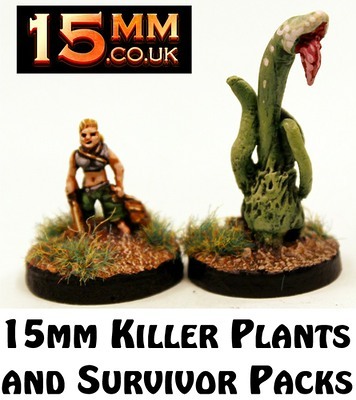 Killer Plants and Survivors 15mm packs released! We are delighted to present three new packs released into the SHM 15mm range (Self Help Miniatures) by new designer Craig Armstrong. Killer Plants and Survivors and we think they are Triffic! Craig has one other code in the SHM range and it is SHM88 Bestial Cyclops. While the three packs are being sold as packs you can also select single miniatures from the packs too using a drop down menu on the product pages since every figure is a character. Very useful in a lot of wargame systems. Go HERE or read on for more information. 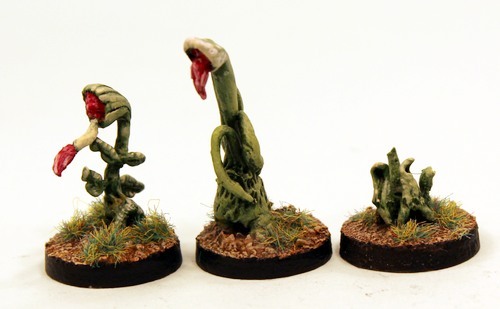 This pack contains three different white metal 15mm scale plant creatures. They are a grown plant spitting its acid, a larger plant in motion with limbs flailing and a newly sprouted plant. You can purchase a pack or choose miniatures from the pack with poses running from left to right. Supplied Unpainted and without Bases. Shown mounted on 20mm round bases. Price 2.50GBP Go HERE. 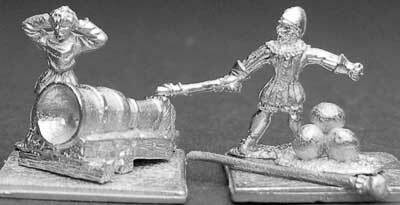 This pack contains seven different white metal 15mm scale humans. From left to right in the image they are a Riot Cop nightstick raised with separate shield, Male Survivor running, Riot Cap nightstick lowered with separate shield, Male Survivor sword raised, Male Paramilitary with knife, Male Survivor in coat with shotgun and Sporting guy with double barrelled shotgun. You can purchase a pack or choose miniatures from the pack with poses running from left to right. Supplied Unpainted and without Bases. Shown mounted on 20mm round bases. Price 2.90GBP Go HERE. This pack contains eight different white metal 15mm scale humans. From left to right in the image they are a Female Survivor comforting a small child, Survivor with automatic rifle, elderly Male Survivor with cricket bat, elderly Male Survivor with pistol and loot sack, Female injured Survivor, teenage Male Survivor, Female veteran long haired Survivor with sack and bat, Paramilitary Man waving to stop holding a sub-machine gun. You can purchase a pack or choose miniatures from the pack with poses running from left to right. Supplied Unpainted and without Bases. Shown mounted on 20mm round bases. Price 3.30GBP Go HERE. Above is an image of all the miniatures in this release so that you may see them alongside each other. Enjoy! 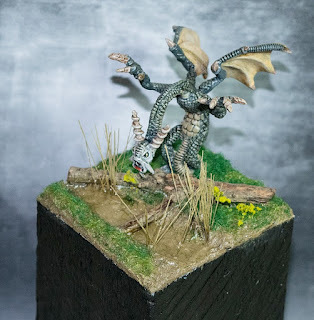 A brillig gift by Matt 15mm Jabberwock and August offers! 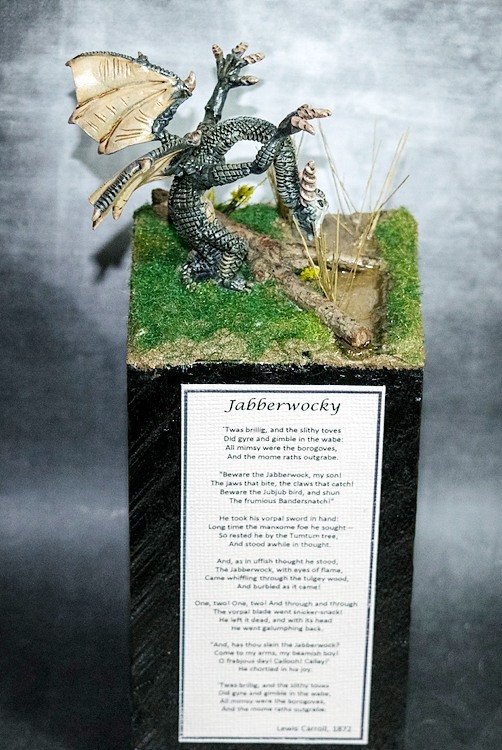 A regular customer of 15mm.co.uk recently got in touch with us and showed us the lovely gift he had made for his wife using our HOT94 Jabberwock. I was so impressed that I wanted to show everyone what this fellow Matt in Australia had done. 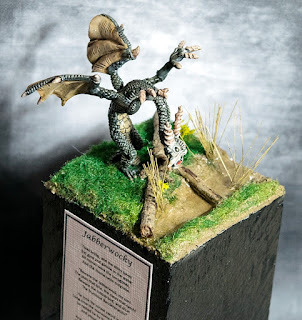 He took this excellent 15mm monster and after painting it up placed it on a scenic base atop of tall plinth upon which are the words of Lewis Carroll; the origin of this fabulous creature. We hope you enjoy these images and a big well done from our team including the designer of our Jabberwock Sam Croes. An excellent gift. 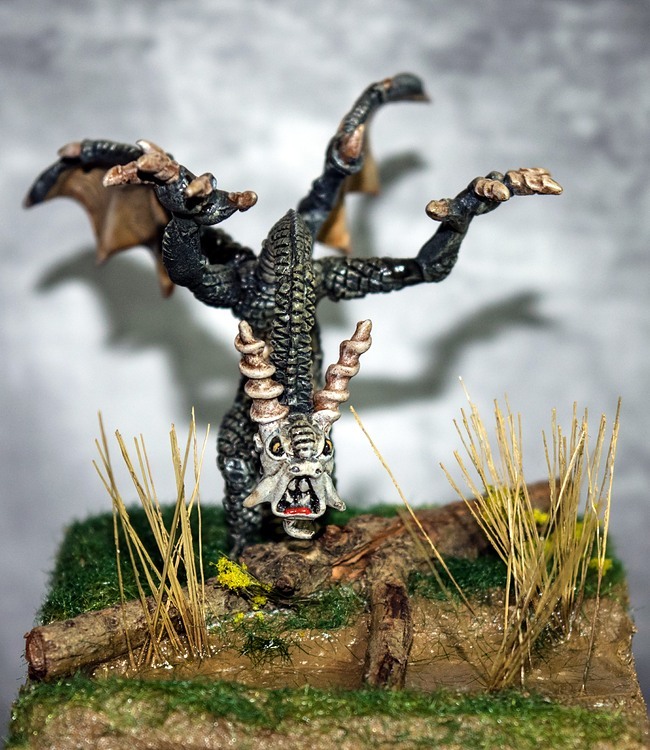 If you are interested you can see our monster in the HOT 15mm Fantasy range HERE. Below are three other pictures of Matt's gift showing it from different angles. We have four new offers on our Deals and Offers page for August 2016 and all of them are 25% off the list prices on fantasy, science fiction and historical codes. Go HERE to see them and they end on the 1st September 2016. In addition to the HOT94 Jabberwock in celebration of this article we have 25% off HOT33 Chimera monster, 25% off the DR7 Imperial Crab classic droid and lastly 25% off MEG1 Bombard and Crew from our Medus 15mm Medieval range. Check them out!